Line of sight had dropped to less than 25 yards. From his firing position behind the courtyard wall he had a perfect view of the woods; but not much else. Even though he had fought through North Africa and survived the landings at Normandy, he was scared. No training could have prepared him for this. Bolt Action Zombie Horde was a special event held at Tyton Games on October 30. 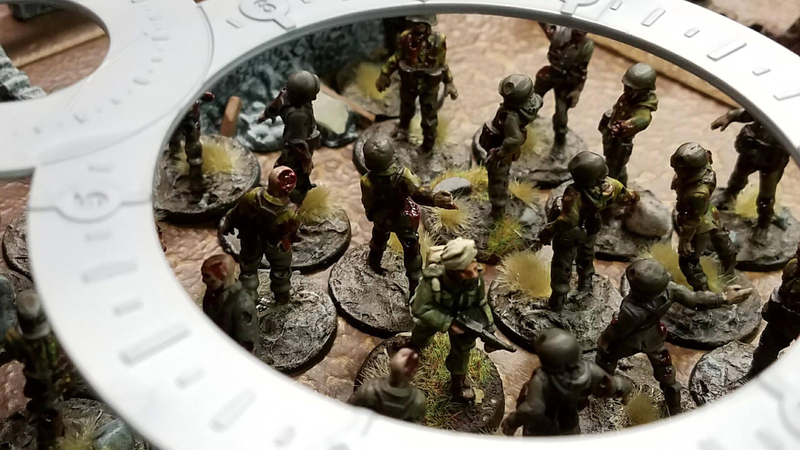 Inspired by Call of Duty: Nazi Zombies and Konflict ’47, Ty and I created a set of rules for a team of survivors to holdout against endless waves of zombies. We had the survivors start within the walls of the abandoned town. The ruins would provide a fallback position as the zombies slowly advanced. On a players turn they could move and fire a weapon before passing to the next survivor. Once the survivors had each completed a turn, the zombies would all move 6″ towards the nearest survivor. Once the zombies moved, another wave of zombies spawned along the four table edges (we played with five spawning per edge). And so it began! The survivors desperately tried to thin the shambling hordes.To help out the survivors, we created a list of special weapons they could earn. For every ten kills, a survivor could roll on the Weapons Chart with a chance to find a new weapon like a BAR, flame thrower, satchel charge, or an LMG just to name a few. Of course, even with the extra firepower, the Zombies never, ever stopped coming. The arrival of a supply Jeep with extra grenades and med-kits helped, but it was still not enough. The survivors might had stood a chance if not for some “random” events late in the game. On round 13 – fast zombies. Round 17 – double zombie activation, and round 18 – tough zombies. 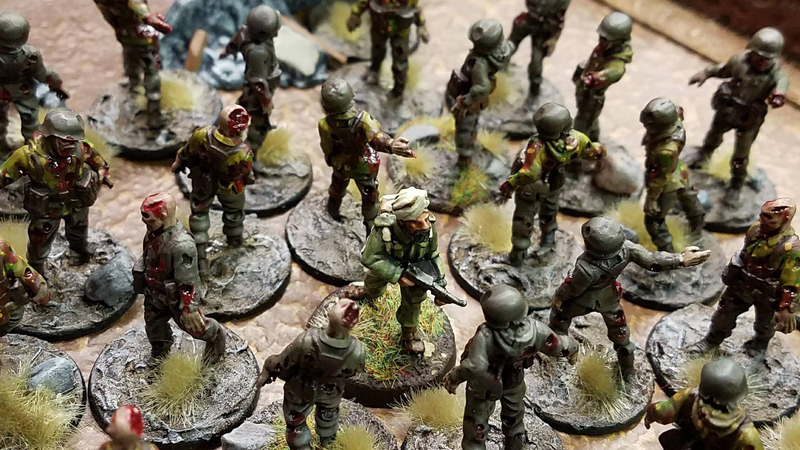 Eventually, after 19 rounds to play, the last survivor fell to the zombies in spectacular fashion – fully surrounded with a satchel charge in hand and took a dozen zombies down with him. All told, the 10 players manged to eliminate 284 zombies over 19 rounds. The game started out slowly and manageable and developed into absolute madness. The game was a lot of fun and we look forward to tweaking the game, adding more depth and making it a more narrative style event for next year. Huge thanks to Tyton Games for hosting! This looks like so much fun! Is there any way to share the rules you used as my gaming group and I are interested in playing this out as well? Enjoyed the writeup and hope to hear more on this in the future! Hi Anthony! Thanks for the praise! As for the rules, there really ins’t much to share. Ty and I only had two pieces of paper with our ‘guidelines’ on them, I wouldn’t even call them rules! We played it very fluid during the event. We had a sheet with the 1-20 list of weapons for the survivors to earn when they earned 10 kills. All the weapons are straight out of the Bolt Action rules – Bazooka, LMG, MMG, HMG, shotgun, pistol, and so on. 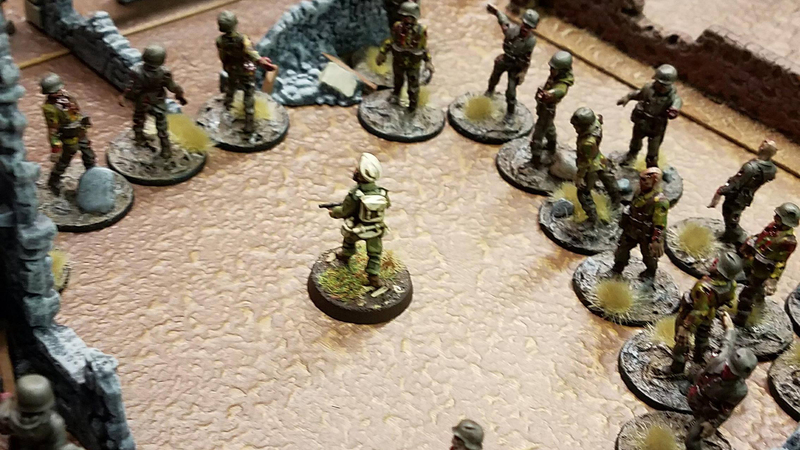 The only other rules we had were for how fast the zombies moved (6″), and the actions a survivor could take on their turn (move and shoot or shoot and move). That’s it! The rest we really just kind of made us as we went along! I highly recommend playing around with the rules on your own game! Make the zombies faster, slower, give survivors more wounds, play around with how many shots and weapon has, go crazy! Let me know if you have any questions! Enjoy and good luck! Great idea and sounds a lot of fun, how do we get hold of the rules so we can all enjoy the experience. It sure was Lee! Please see my reply to Anthony above, I am afraid there are not ‘rules’ to share. We had just a few guidelines after our one and only play test and during the event we just did what felt right. Let me know if I can help any further!